With 23,602,141 downloads and counting, WooCommerce is powering over 28% of all online stores and is an eCommerce platform from the same people who bring us WordPress. WooCommerce is now the most popular eCommerce platform on the web and is the go-to solution for most online shops powered by WordPress. Like WordPress, WooCommerce’s popularity is due to it’s ease of use, it’s feature set, a mass of friendly developers, it’s highly extendable nature, and a host of other reasons. With the arrival of WooComerce 3.0 we see many new features, improvements, and other stuff to look forward to. One of the major new features of WC3 is the new product gallery which has now been built into the core code. This new gallery is more intuitive – when you click on a thumbnail this will update the main image instead of in the past when it opened an additional lightbox. We also now get the ability to magnify and zoom, and the latter offers better support for touch – enabling users to use gestures to scroll, zoom and close. WC3 includes a lot of optimisation measures to make it run faster. We see the introduction of new taxonomies to the WordPress database that will be used in place of post meta. This makes WC3 more scalable and improves performance even for large sets of products – in testing there has been an increase of up to 94%! Other changes to increase performance include changes to templates and the product loop as well as increased checkout performance by deferring emails. Additionally, when updating products only what you update is written back to the database, rather than all the product data. Finally, we have the introduction of CRUD (Create, Read, Update, Delete) classes, which are used for orders, products, customers, line items, shipping zones, payment tokens, and coupons. These new classes will give a unified way of dealing with the database – which in turn makes the storage and retrieval of data more efficient and simplified, thus reducing code & margin of error and increasing performance. 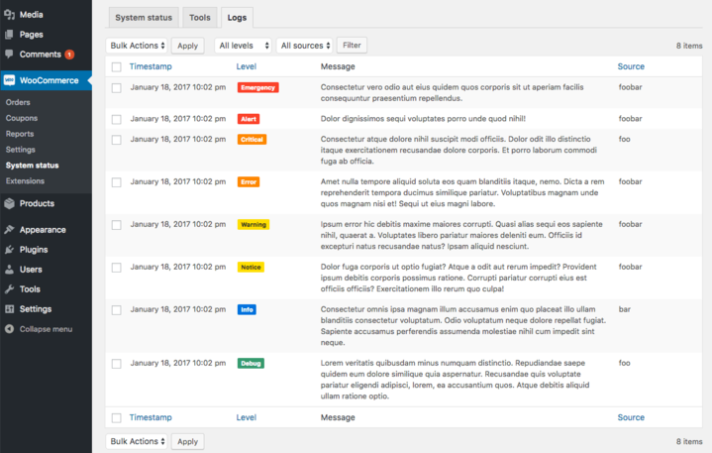 The improved logger now includes notification levels such as debug, emergency, critical, alert or notice – which makes it much easier to keep track of the plugin’s activity. REMEMBER: before you upgrade to a major release…. backup, backup, backup – because there’s a good chance some of your WooCommerce extensions might stop working. If you can – CuCo recommend updating on your staging/development server first to make sure everything still works as it should! Thinking of upgrading your eCommerce site and would like to chat through your options? Don’t be shy – drop us a line. Previous Post: Above The Line vs Below The Line Marketing – Which Is Right For Your Business? Next Post: WordPress is best – and here’s 10 reasons why!